Journalist: Mr. President, thank you for having us and allowing NBC News to ask you some important questions. President Assad: You’re most welcome in Damascus. Question 1: A few weeks ago, you told lawmakers here that you would retake every inch of Syria. The U.S. State Department called that “delusional.” You’re a long way from winning this war, aren’t you? Never mind retaking every inch of Syria. President Assad: Actually, the Syrian Army has made a lot of advancement recently, and that is the goal of any army or any government. I don’t think the statement for the United States is relevant. It doesn’t reflect any respect to the international law, to the Charter of the United Nations. It doesn’t reflect respect of the sovereignty of a country that it had the right to take control of its full land. Question 2: But how long do you think this will take you to win this war? President Assad: You’re talking about something that is related to many factors. The most important factor is how long are the supporters of those terrorists are going to keep supporting them, especially Turkey, Qatar and Saudi Arabia, with the endorsement of some Western countries including the United States. If you don’t have that support, it won’t take more than a few months. Question 3: More than a few months. You see, I’ve been here ten times, and I’ve heard your governors say “it will take a month to retake Homs, it will take six months to retake somewhere else.” It always takes longer than that. So, realistically, this will take years, won’t it? President Assad: That’s why I said that depends on how much support the terrorists are going to have, how much recruitment are you going to have in Turkey with the Saudi money, to have more terrorists coming to Syria. Their aim is to prolong the war, so they can prolong it if they want, and they’ve already succeeded in that. So, that depends on the question. If you’re talking about how much it’s going to take as only a Syrian conflict, an isolated conflict, this is where it won’t take more than a few months. But if it’s not isolated, as is the case today with the interference of many regional and international powers, it will be going to take a long time, and no-one has the answer to the question you have posed. Nobody knows how the war is going to develop. Question 4: A year ago, the war was going quite differently. You made a speech in which you said you were short of troops, you had to give up some areas reluctantly. What changed after that? Was it that Russia entered the war? That’s the real reason this war is turning, isn’t it? That Russia is on your side. President Assad: Definitely, the Russian support of the Syrian Army has tipped the scales against the terrorists. Question 5: It’s the crucial factor? President Assad: It is, it is, definitely. At the same time, Turkey and Saudi Arabia have sent more troops since that Russian legal intervention started, but in spite of that, it was the crucial factor, as you just mentioned. Question 6: So, you owe President Putin a lot. President Assad: Everyone who stood beside us; Russians, Iranians, and even the Chinese stood, but each one in its own way, whether political, military, or economic, because it’s not one factor; you cannot only talk about the firepower or the human resources. It’s a multi-factor issue. All those countries supported Syria, beside other countries who supported to a lesser degree. Question 7: Has President Putin demanded anything of you? What’s the deal? President Assad: When he wanted to intervene? He didn’t ask for anything. President Assad: For a simple reason: first of all, their politics are built on values. This is very important. The second thing, their interest is common interest with us now, because they are fighting the same terrorists that they should fight in Russia. We are fighting the terrorists that could be fighting in Europe, in the United States, anywhere else in the world. But the difference between President Putin and the other Western officials is that he could see that clearly while the other officials in Europe or in the West in general couldn’t see that. That’s why his intervention is based on values, and at the same time based on the interest of the Russian people. Question 9: Do you speak much with him? President Assad: When there’s something to speak about, of course we speak, or through officials. Question 10: How often, for example, this year, have you spoken with him? President Assad: I didn’t count them, but many times. We spoke many times. Question 11: And how would you describe your relationship with him? President Assad: Very frank, very honest, mutual respect. Question 12: But he has demanded nothing of you, is that the case? President Assad: Nothing at all, nothing at all. Question 13: Because the suspicion is that Russia may be working in concert with the United States, and Secretary of State Kerry is meeting Vladimir Putin Thursday in Moscow. The suspicion is that they are coming to some sort of deal that might be bad news for you. President Assad: First of all, regarding the first part, if he wanted to ask for something, he would ask me to fight the terrorists, because this is where his interest as a president and as a country – I mean Russia – lies. Second, regarding that allegation from time to time, that the Russians met with the Americans and they discussed something about the Syrian issue, like, in order to give the impression that they are deciding what is going to happen in Syria. Many times, the Russian officials many times said clearly that the Syrian issue is related to the Syrian people, and yesterday Minister Lavrov said that clearly; said we cannot sit with the Americans to define what the Syrians want to do. This is a Syrian issue, only the Syrian people can define the future of their country and how to solve their problem. The role of Russia and the United States is to offer the international atmosphere, to protect the Syrians from any intervention. The problem in that regard is that the Russians are honest, the Americans didn’t deliver anything in that regard. But, this is not to take the decision about what we have to do as Syrians. Question 14: So just to be clear: neither Foreign Secretary Lavrov nor President Putin has ever talked to you about political transition, about a day when you would leave power? That’s never come up? President Assad: Never, because as I said, this is related to the Syrian people. Only the Syrian people define who’s going to be the president, when to come, and when to go. They never said a single word regarding this. Question 15: And you’re not worried in the least about Secretary Kerry meeting Vladimir Putin and coming to an understanding in which you may have to leave power? President Assad: No, for one reason: because their politics, I mean the Russian politics, is not based on making deals; it’s based on values. And that’s why you don’t see any achievement between them and the Americans because of different principles. The American politics are based on making deals, regardless of the values, which is not the case for the Russians. Question 16: But of course it’s not just Russia that’s bombing your enemies; it’s the United States. Do you welcome American airstrikes against ISIS? President Assad: No, because it’s not legal. First of all, it’s not legal. Question 17: It’s not legal for Russia to do it, is it? President Assad: No, they are invited legally and formally by the Syrian government. It’s the right of any government to invite any other country to help in any issue. So, they are legal in Syria, while the Americans are not legal, with their allies, of course all of them are not legal. This is first. Second, since the Russian intervention, terrorism has been, let’s say, regressing, while before that, and during the American illegal intervention with their allies ISIS was expanding and terrorism was expanding and taking over new areas in Syria. They’re not serious. So, I cannot say I welcome the un-seriousness and to be in Syria illegally. Question 18: Thousands of missions, hundreds of airstrikes… the United States is not being serious in Syria? President Assad: The question is not how many strikes. What is the achievement? That’s the question. The reality is telling, the reality is telling that since the beginning of the American airstrikes, terrorism has been expanding and prevailing, not vice versa. It only shrank when the Russians intervened. So, this is reality. We have to talk about facts, it’s not only about the pro forma action that they’ve been taking. Question 19: So, American airstrikes are ineffective and counterproductive? President Assad: Yes, it is counterproductive somehow. When terrorism is growing, it is counterproductive. That’s correct. Question 20: Whose fault is that? Is that a military fault, or is President Obama simply not being, let’s say, ruthless enough? President Assad: No, first of all it’s not about being ruthless; it’s about being genuine. It’s about the real intentions, it’s about being serious, it’s about having the will. The United States doesn’t have the will to defeat the terrorists; it had the will to control them and to use them as a card like they did in Afghanistan. That will reflected on the military aspect of the issue. If you want to compare, more than a hundred and twenty or thirty Russian airstrikes in a few areas in Syria, compared to ten or twelve American allies’ airstrikes in Syria and Iraq, it means militarily nothing. But that military ineffectiveness is a reflection of the political will. Question 21: There was a political will, as you put it, to remove you from power. That was the will of Washington. That seems to have changed. Have you any idea why the United States has changed its mind apparently about your future? President Assad: No, because the problem with the American officials is that they say something and they mask their intentions, they go in a different way. They say something, they say the opposite. They say something, they do something different. So, you cannot tell what are their real intentions. What I’m sure about is that they don’t have good intentions towards Syria. Maybe they are making tactics, maneuvers, but they haven’t changed their intentions, as I believe. Question 22: President Obama wanted you out. He’s leaving office soon, and you’re staying. Did you win? President Assad: No, it’s not between me and him. It’s between me and whoever wants to destroy this country, and mainly the terrorists within Syria now. This is where we can win as Syrians; if we can get rid of those terrorists, if we can restore the stability in Syria, this is where we win. Otherwise, we cannot talk about winning. That’s true, they didn’t succeed, but if they don’t succeed in their plans, if it went into a fiasco, it doesn’t mean we win the war. So I have to be realistic and precise about choosing the terms in that regard. Question 23: But one of the president’s key aims, which was to remove you from power, has clearly failed, or do you believe it’s failed? President Assad: Yeah, I said he’s failed, but that doesn’t mean I win, because for him the war is to remove me, for me the war is not to stay in my position; for me the war is to restore Syria. So, you’re talking about two different wars; for me I’m not fighting my war, I’m not fighting the war that the president should stay. My war is to protect Syria. I don’t care about if I stay or not as long as the Syrians don’t want me to be in my position. For me, I don’t care about what the other presidents want; I care about what the Syrians want. If they want me to stay, I’m going to stay, if they want me to leave, I’m going to leave. So, it’s different, a completely different thing. Question 24: Do you feel the United States has fundamentally misunderstood your war with ISIS, with what you might call a common enemy? President Assad: Again, it’s not a common enemy, because for us we are genuine in fighting not only ISIS but al-Nusra and every affiliated to Al Qaeda organization within Syria. All of them are terrorists. So, if you want to talk not about ISIS, about the terrorist groups, we wanted to get rid of the terrorists, we wanted to defeat those terrorists, while the United States wanted to manage those groups in order to topple the government in Syria. So, you cannot talk about common interest unless they really want to fight those terrorists and to defeat them, and they didn’t do that. They’ve been in Iraq in 2006, they didn’t try to defeat them. Question 25: But America is very genuine about fighting ISIS. ISIS is a threat to the American homeland. How can you say America is not serious about fighting ISIS? President Assad: Because ISIS has been set up in Iraq in 2006 while the United States was in Iraq, not Syria was in Iraq, so it was growing under the supervision of the American authority in Iraq, and they didn’t do anything to fight ISIS at that time. So why to fight it now? And they don’t fight it now. It’s been expanding under the supervision of the American airplanes, and they could have seen ISIS using the oil fields and exporting oil to Turkey, and they didn’t try to attack any convoy of ISIS. How could they be against ISIS? They cannot see, they don’t see? How the Russians could have seen it from the first day and started attacking those convoys? Actually, the Russian intervention unmasked the American intentions regarding ISIS, and the other terrorist groups, of course. Question 26: Three years ago, President Obama made a threat against you. He drew a red line, and then withdrew from that and did not attack you. What do you feel about that? Is that the sign of a weak president? President Assad: That’s the problem with the United States. They’ve been promoting for years now that the only good president is ruthless or tough and who should go to war. This is the definition. Otherwise, he’s going to be a weak president, which is not true. Actually, for the American administrations since the second World War, they have shared in stoking the fire in conflicts in every part of this world. And as the time goes by, those administrations are becoming more and more pyromaniac. The difference now between those administrations is only about the means, not about the goal. One of them sends his own troops, like Bush, the other one is using surrogate mercenaries, the third one using proxies, and so on, but the core is the same, nothing has changed. Question 27: But to go back to that moment three years ago, was that the sign of a weak United States and a weak president? President Assad: No, because if you want to talk about the core, which is the war attacking Syria, they’ve been attacking Syria through proxies. They didn’t fight ISIS, they didn’t make any pressure on Turkey or Saudi Arabia in order to tell them “stop sending money and personnel and every logistic support to those terrorists.” They could have done so, they didn’t. So, actually they are waging war, but in a different way. They didn’t send their troops, they didn’t attack with missiles, but they send mercenaries. That’s what I meant. I mean, it’s the same. Question 28: Did it surprise you that they didn’t attack? President Assad: No, no. It wasn’t a surprise, but I think what they are doing now had the same effect. So, between mercenaries and between missiles, this one could be more effective for them. So, no, I couldn’t say that I was surprised. Question 29: You’re a leader. By drawing a red line and not following through, has that damaged America’s credibility, not just in the Middle East, but in the world? President Assad: But this credibility hasn’t ever existed for us, at least since the early 70s, to be frank with you, since we restored our relations with the United States in 1974 we never saw any administration that has real credibility in every issue we dealt with. They never had it. So, I cannot say that it is harmed. Many of their allies don’t believe them. I think the American credibility, not because of what you mentioned, because of their politics in general, their mainstream politics, are at an all-time low. That’s how we see it. Question 30: An all-time low in terms of its credibility in the world? President Assad: Generally, yeah. Regarding the politics in general, not regarding Syria. Yeah. Question 31: Do you welcome the end of President Obama’s term of office? President Assad: It means nothing for us, because if you change administration but you don’t change politics, it means nothing. So, it’s about the politics, and in Syria we never bet on any president coming or any president going. We never bet. Because what they say in their campaign is different from what they practice after they are elected. Question 32: You’ve talked about presidents being the same, never changing their policy, but there will be a new president in the United States next year. Do you hope for a new relationship? Do you believe anything like that is possible? President Assad: Yeah, of course. We always hope that the next president will be much wiser than the previous one, less pyromaniac as I said, less militaristic, adventurist president. That’s what we hope, but we never saw. I mean the difference is very marginal. So, we keep hoping, but we don’t bet on that hope. Question 33: So, there will be a new president. There are two main choices: one of them is Donald Trump. What do you know of Mr. Trump? President Assad: Nothing. Just what I heard in the media, and during the campaign. That’s what I say, we don’t have to waste our time hearing what they say in their campaign; they’re going to change after they are elected, and this is where we have to start evaluating the president, after the campaign, not during the campaign. Question 34: And you’re here in Damascus, what are you hearing in the media about Mr. Trump? 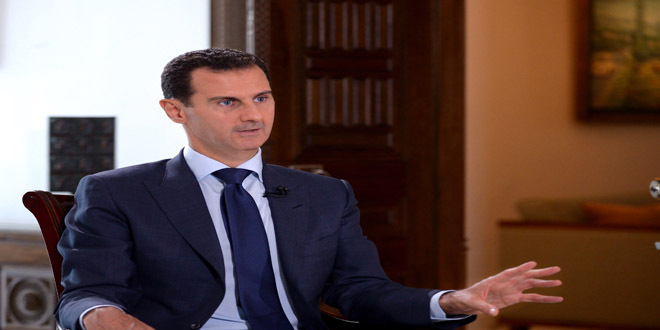 President Assad: The conflict between the Americans, but we don’t pay much attention to it. I mean, even this rhetoric between the different, let’s say, nominees, is changing during the campaign. So, what you hear today is not relevant tomorrow. So, we cannot build our politics on day-to-day politics. Question 35: But you’re following this election? President Assad: Not really, not really. Because as I said, you don’t follow anything that you cannot consider as connected to the reality yet. It’s only connected to the reality when they are in office. So far, it’s only rhetoric. We don’t have to waste our time with rhetoric. Question 36: Simply rhetoric. So, for example, talking about Mr. Trump; anything Mr. Trump says, you wouldn’t necessarily believe that would be the policy of a President Trump? President Assad: No, we cannot. Whether Trump or Clinton or anyone. I’m talking in general, it’s not about the names. It’s a principle for every American president in every campaign. Question 37: He’s made very few comments about Syria or the Middle East, but he’s described you as a “bad guy.” Does that worry you? President Assad: That’s his opinion. No, it’s a personal opinion. He doesn’t have to see me as a good guy. The question for me: do the Syrians see me as a good guy or a bad guy, not an American person or president or nominee. I don’t care about it. It’s not part of my political map, let’s say. Question 38: One of the things he’s said and been very clear about is that he would be much tougher on ISIS. You would welcome that, wouldn’t you? Because you just said President Obama isn’t serious. President Assad: You don’t have to be tougher. This word doesn’t have any meaning in reality, in real life, in this region. You have to fight ISIS in different ways. ISIS is not only fighters you have to attack with the strongest bomb or missile. It’s not like this. The issue of terrorism is very complicated, it’s related to the ideology. How can you be tough against the ideology of ISIS? That’s the question. How can you be tough regarding their economy, how they offer money and donations? How can you deal with that? President Assad: It’s not enough, it’s not enough. You have to be smart. It’s not enough to be tough. First of all, you have to have the will, you have to be genuine, then you have to be smart, then you can be tough, and being tough and being militarily active, this is important, but this is the last option when you fulfill the first criteria. Question 40: From what you know of Mr. Trump, is he smart enough? President Assad: I don’t know him. When I sit with him face-to-face, I can judge him, but I only look at the person on the TV, and you know on the TV you can manipulate everything, you can make, how to say, you can rehearse, you can prepare yourself, so that’s not the issue. Question 41: Do you like what you see on TV of Mr. Trump? President Assad: I don’t follow the American elections as I said, because we don’t bet on it. We don’t follow it. Question 42: He seems to respect President Putin. Does that give you hope that maybe he’s a man you could do business with? President Assad: If he’s genuine, I think he’s saying the right thing, because every person on Earth, whether they agree or disagree with President Putin, should respect him, because he’s respectable. He respects himself, and he respects the other, he respects his values, respects the interests of his own people, and he’s honest and genuine. So, how can’t you respect someone with those descriptions? If he’s genuine, I think he’s correct. That’s what I can say. Question 43: Mr. Trump has also made comments about Muslims, and not allowing Muslims into the United States. Did that anger you, upset you? President Assad: Yeah, especially in Syria as a melting pot country made of many, many religions and sects and ethnicities, we think this diversity is richness, not the opposite. It’s the way the government and the way the influential forces in the society that made it a problem or a conflict. If you can have all those people living in one society with real integration, with harmony, this is richness, this is for the interest of any society, including the United States. Question 44: So, Mr. Trump should not have made those comments about Muslims? President Assad: Anyone shouldn’t make any discriminative rhetoric in any country. I don’t believe in this kind of rhetoric, of course. Question 45: Mr. Trump has no experience in foreign policy. Does that worry you? President Assad: Who had this experience before? Obama or George Bush or Clinton before? No-one of them had any experience. This is the problem with the United States. You have to look for a statesman who has real experience in politics for years, not because of having a position in Congress for a few years or being minister of foreign affairs for example. That doesn’t mean you have the experience. The experience in states should be much much longer. So we don’t think that most of the presidents of the United States were well-versed in politics. Question 46: So, a man with no experience in foreign policy in the White House is not necessarily dangerous in your view? President Assad: Anyone who doesn’t have experience in any position, in the White House or in the Presidential Palace in Syria or any other country, is of course dangerous for the country, generally. Of course, the United States as a great power, could have more impacts on the rest of the world. But it’s not only about the experience. At the end, when you have institutions, they can help. It’s about the intention. Is he going to be with good experience but with militaristic intentions? Destructive intentions and so on? So, you have to talk about many factors. It’s not enough to talk only about the experience. Question 47: Someone with more experience in foreign affairs is Hillary Clinton. She is known to you, in one sense. What would the consequences be if Hillary Clinton wins the election? President Assad: Again, the same, I have to repeat the same answer. It depends on her politics. What politics is she going to adopt? Is she going to prove that she’s tough and take the United States to another war or to make escalations? This is where it’s going to be bad for everyone, including the United States. If she’s going to go in another direction, that will be good. And again, we focus more about the intentions before talking about the experience. The experience is very important, but the intention is the most crucial thing for any president. So, can you ask them the question: can they tell genuinely the American people and the rest of the world what their real intentions about their politics are? Are they going to make escalation or we’re going to see more entente around the world? Question 48: Well, one difference between them clearly is that Mrs. Clinton is determined, it seems still, to get rid of you. At least that’s her stated position. Mr. Trump says he’s focusing on ISIS, leave you alone. That’s a clear difference between the two. Hillary Clinton, well, I’ll ask you the question: does Hillary Clinton represent more of a threat to you than Donald Trump? President Assad: No, because since the beginning of this crisis we heard the same motto “Assad must go” many times from nearly every Western official in different levels, whether leader or foreign official or any other official. We never cared about it. So you cannot talk about this as a threat; this is interfering in our internal issues we’re not going to respond to. As long as I have the support of the Syrian people, I don’t care about whoever talks, including the president of the United States himself. Anyone. So it’s the same for us. That’s why I say Clinton and Trump and what Obama said, for me, nothing. We don’t put it on the political map, we don’t waste our time with those rhetoric, or even demands. Question 49: But if Hillary Clinton as president establishes a no-fly zone over your territory, over northern Syrian for example, that makes a huge difference. President Assad: Of course. This is where you can talk about threat, that’s why I said the policy is the crucial thing for us. When they started supporting the terrorists with such projects or plan or step, this is where you can have more chaos in the world. That’s another question: does the United States have an interest in having more chaos around the world, or the United States have more interest in having stability around the world? That’s another question. Of course, the United States can create chaos. They’ve been creating chaos for the last 50-60 years around the world. It’s not something new. Are they going to make it worse, more prevailing? That’s another question. But it’s not about me. It’s not about the president. It’s about the whole situation in the world, because you cannot separate the situation in Syria from the situation in the Middle East, and when the Middle East is not stable, the world cannot be stable. Question 50: Let me just probe you about how far you might want a new relationship with the United States. ISIS is headquartered in your country in Raqqa. If you knew that ISIS was about to attack the United States, would you warn America? President Assad: As a principle, yes, because they may attack civilians, and I cannot blame the innocents in the United States for the bad intentions of their officials. This is not correct. And as I said many times, I don’t consider the United States as a direct enemy as they don’t occupy my land. But at the same time, this is, let’s say, not realistic, for one reason; because there’s no relation between us and the United States. This kind of information or cooperation needs security cooperation based on political cooperation. We have neither. So you cannot have it anyway. Question 51: I’ve spoken to your [Deputy] Foreign Minister Dr. Fayssal Mikdad many times, and he’s described to me the danger of Syria and its crisis exploding, not just across the Middle East, but across the world, and that has clearly happened. Is, as ISIS is driven back or broken, is there a danger that their fighters scatter? Is there a danger that as you defeat ISIS, the United States becomes more vulnerable to terrorism? President Assad: No. If we defeat ISIS we are helping the rest of the world, because those terrorists coming from more than a hundred countries around the world, including the Western countries, if they aren’t defeated they will go back with more experience, more fanaticism, and more extremism, and they’re going to attack in those countries. So, if we defeat them here, we are helping every other country, including the United States. Question 52: But ISIS fighters may leave Raqqa, and as we’ve seen with terrorist attacks in Europe, they come to France, they come to Belgium. They could come to the United States as well and attack. That is a real risk, isn’t it? President Assad: Yeah, that’s what I’m talking about. I said if we defeat them here, if we defeat terrorism in the meaning they cannot go back, we are helping then. If they leave, if they escape, if you keep having this terrorism, this is where you can start exporting those terrorists to Europe, as what happened in France recently. So what you said is correct, that’s what I mean. If we defeat them here, and they cannot go back, this is where we help the others. If they go back, they will be a danger to the rest of the world. Question 53: Like any war, there are two sides. Your forces have been accused of doing some terrible things. I’ve been here many times and I have seen some of the terrible things as a result of your forces’ airstrikes, bombardments, and so on. Do you believe one day you will face an international court? 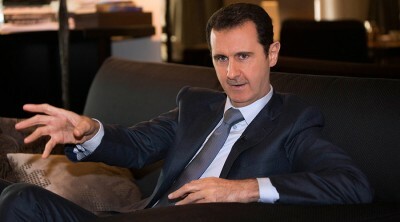 President Assad: First of all, you have to do your job as a president. When you are attacked by terrorists, I mean as a country, you have to defend your country, and that is my job according to the constitution. So, I’m doing my job, and I’m going to keep doing it no matter what I’m going to face. Let’s be clear about this. Defending the country cannot be balanced with the personal future of the president, whether he is going to face a criminal court or anything like that, or to face death. It doesn’t matter. If you don’t want to face all these things, leave that position and give it to someone else. Question 54: But the reason people are saying you should face a war crimes tribunal is that you are clearly using any means whatsoever. I mean, I know you don’t agree that there are such a thing as a barrel bomb. Never mind the metal, the charges that you are using, indiscriminate force, indiscriminate weapons in civilian areas. That’s true, isn’t it? President Assad: First of all, those people, do they have any criteria that what the means that you should use with the terrorists? They don’t have. So, this is irrelevant. It has no meaning from a legal point of view and from a realistic point of view. Second, if you talk about indiscriminate, no army would use indiscriminate armaments in such a situation where there’s nearly intermingle between the two sides. Question 55: With respect Mr. President, I have seen a bomb thrown from a helicopter. That was indiscriminate. President Assad: Let’s say, technically, this is not the issue whether to throw it from a helicopter or from an aircraft. So, this is not the issue. The more important thing, if you want to talk about precise, let’s say we are using precise armaments like the Unites States using the drones and the highest precision missiles in Afghanistan, how many terrorists have they killed so far? They have killed many, many folds of civilians and innocents. Question 56: Even if that’s true, that doesn’t make anything that you do right. Question 57: With respect, it is not just a media campaign. The United Nations, as you well know, has spoken about this. Human rights groups have spoken about this, not just indiscriminate use of weapons against civilians, but the UN spoke this week about the problems in Aleppo, in Darayya, which is just very close to here, of the use of starvation as a weapon of war, sieges. That’s going on right now close to us, isn’t it? Question 58: And you know there’s a charge that you have used chemical weapons, which you deny. President Assad: We didn’t. So far, it has been three years and no one had offered any evidence regarding this, only allegations. Question 59: There is plenty of evidence but you reject them. President Assad: Nothing. You have a delegation coming from the international organization of chemical weapons. They came to Syria and they didn’t have any evidence. They went and collected everything, samples and everything to offer evidence, but they couldn’t. There is no evidence. So, we didn’t use it, and there is no logic in using it. Question 61: Let’s talk about the methods your forces are using close to here which is cutting off an area and besieging it, and there are thousands of civilians very close to here, who are starving. Do you recognize that? President Assad: Let’s presume that what you are saying is correct, let’s presume that. Now, you are talking about encircled or besieged by the army for years now, not for months, for years. They don’t have food, and every basics because the government doesn’t allow them, but at the same time they have been fighting for two years, and they have been shelling us with mortars and killing civilians from their area. It means, according to this narrative, that we are allowing them to have armaments, but we don’t allow them to have food, is that realistic? Question 62: That’s what the UN says. The UN says, for example, in Madaya it’s only managed to get four aid convoys in, in all these years. President Assad: How do we prevent them from having food and we don’t prevent them from having armaments to kill us? What is the logic in this? This is contradiction. We either besiege everything or we allow everything. This is first. Second, the proof that this is not correct is that you have every video about the convoys coming from the United Nations to reach those areas. Otherwise, how could they survive for years if they are under the siege? It’s been years, they have been talking about the same narrative, repeating, reiterating for years now, but people are still alive, how could they live without food? Question 63: As you know, targeting civilians in a war is a war crime and just recently, the family of Marie Colvin, an American journalist, has launched a suit in the United States charging you and your government with deliberately targeting and killing her. You know Marie Colvin; she was a friend of mine. President Assad: Yeah, a journalist, yeah. Question 64: Did your forces target Marie Colvin and her colleagues with an intention to kill her? Question 65: She is responsible for her own death? President Assad: Of course, she came illegally to Syria. We can be responsible of everyone within our country when they come legally to Syria. She came illegally, and she went with the terrorists. We didn’t send her anywhere, we don’t know anything about her. Question 66: As you know, that doesn’t explain why missiles hit the house that she was in in Homs? President Assad: No, no, nobody knows if she was killed by a missile or which missile or where did the missile come from or how. No one has any evidence. This is just allegations, because it’s a conflict area, it’s a war. You know about crossfire, when you are caught in a crossfire somewhere, you cannot tell who killed who. So, these are allegations. Second, we had hundreds of journalists who came to Syria legally and illegally, and they covered for the terrorists, not for the government, and we didn’t kill them. So, why to single out this person in order to kill her? There is no reason. This is second. Third, tens of journalists working for the government and support the government have been killed, did we kill them? We didn’t. So, this is war. Have you heard about a good war? I don’t think that anyone has heard about a good war. It’s a war. You always have causalities, you always have innocent people being killed by any means, and no one can tell how. President Assad: You only bear the responsibility for the decision that you take. You don’t bear the responsibility for the decision that you didn’t take. Question 68: But some of the decisions you’ve taken have resulted in the deaths of hundreds of thousands of people. Question 69: Attacking certain areas, launching campaigns, airstrikes, the use of certain weapons. Question 70: Do you ever see pictures, photographs, videos of children, for example, in rebel-held areas? And I wonder if you have seen these photographs, what do you feel? Sorrow, regret, nothing? President Assad: My question is, how could you verify that those children that you saw on the internet are in their area? President Assad: No, no, no. Question 72: That actually you don’t care for the people on the other side that your forces kill. President Assad: That question could be answered, if you answer that question: how can you blame now Bush for the one million Iraqis dead since the war in Iraq in 2003? President Assad: No, no. I’m talking about the principle now; it’s about the principle. The same principle. He attacked a sovereign country, while I defend my country. If you want to use one standard, it is one thing, but if you want to do a double standard, that is another thing. Question 74: You’re still not giving me the impression that actually you care very much. President Assad: No, no. I talk to an American audience, so there must be an analogy between the two things, because it is about the logic that you use to explain something. It is not only about my answer. He attacked a sovereign country while we are defending our country. He killed Iraqi people on their land, we are defending mainly against terrorists who are coming from different places in that world. So, this is our right, while to talk about a clean war where there is no causalities, no civilians, no innocent people to be killed, that doesn’t exist. No one could make it. No war in the world. President Assad: Of course, I’m going to talk about the reality, about the facts, while to talk about children being killed, children of who, where, and how? You are talking about propaganda and about media campaigns, and about sometimes fake pictures on the internet. We cannot talk but about the facts. We have to talk about the facts. I cannot talk about allegations. Question 76: Have you ever cried about what happened to Syria? President Assad: Crying doesn’t mean you are a good man, and doesn’t mean you have a lot of passion; it’s about the passion that’s within your heart, it is not about your eyes, it is not about the tears. This is first. Second, as a president, it’s about what you’re going to do, not about how you’re going to feel. How are you going to protect the Syrians? When you have an incident, bad incident, and you have it every day, do you keep crying every day, or you keep working? My question is how I can help whenever I have a bad event or incident. I ask myself how can I protect the other Syrians from having the same problem. Question 77: What are you going to do next? Are you just going to go on and on and on? You and your father have been in power for forty-six years, is that right? 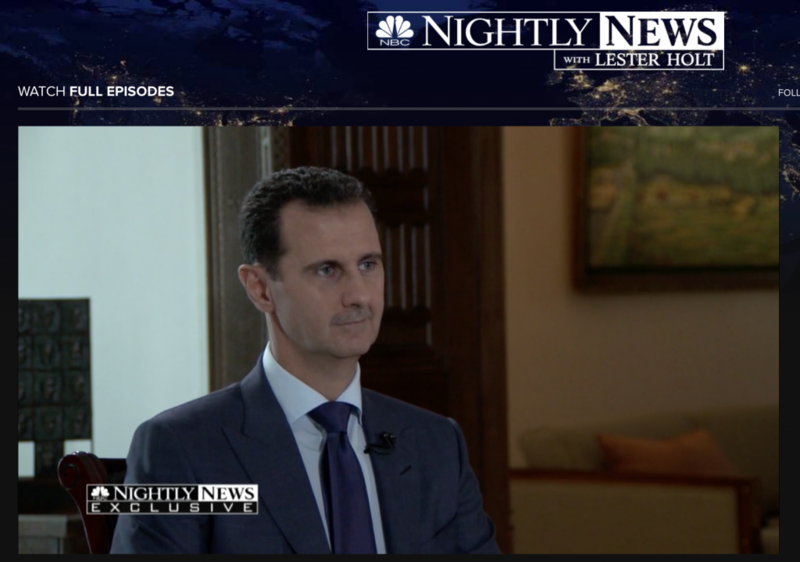 President Assad: No, it’s not right, because he is a president and I am another president. So, it’s not right. The description is not right at all. He was elected by the Syrian people, and I was elected after he died. He didn’t put me in any position, so you cannot connect. I’m a president, and he’s a president. I have been in power for sixteen years, not for forty-five years. Question 78: You have been in power for sixteen years, my question is: are you going to go on and on and on? Question 79: How do you think history will remember you? President Assad: How I hope history will remember me. I cannot foretell; I am not a fortuneteller. I hope that history will see me as the man who protected his country from terrorism and from intervention and saved its sovereignty and the integrity of its land. Question 80: Because you know what the first draft of history is saying, that you’re a brutal dictator, you are a man with blood on your hands, more blood on your hands than even on you father. President Assad: No, again, I will draw that example if you have a doctor who cut the hand because of a gangrene to save the patient, you do not say he’s a brutal doctor. He’s doing his job in order to save the rest of the body. So, when you protect your country from the terrorists and you kill terrorists and you defeat terrorists, you are not brutal; you are a patriot. That is how you look at yourself, and that’s how the people want to look at you. Question 81: And that is how you see yourself, as a patriot? President Assad: I cannot be objective about looking at myself. The most important thing is how the Syrians look at me, that is the real and objective opinion, not my opinion. I cannot be objective about myself. Journalist: Mr. President, thank you very much for answering NBC’s questions and for taking time to talk to me. Thank you very much.